Yamaguchi is a prefecture that is full of great things to see and experience. It has an abundance of temples, shrines, traditional restaurants, beaches, and entertainment spots that should not be missed if you are coming to this part of Japan. However, without a subway, and with quite an expensive bus and Shinkansen system, traveling around Yamaguchi can sometimes be difficult and time consuming if you do not have a car. I read a lot about the driving license test before coming to Japan, and most of those articles were focused on how difficult it is to get a license here, with some going as far as saying that it’s especially difficult to get one as a foreigner. The truth, in my experience, has a lot to do with you and very little with the actual police branch where you are taking the test. So before others try to prepare you for a horror story, I hope that my experience will show you that it is not nearly as hard as some people make it seem to be. Depending on where you are coming from, you may not even need to take the test in order to get a driver’s license in Japan. For example, if you are coming from the United Kingdom, Austria, South Korea, or any of the other countries on this list, you will not be required to actually take the driving test. Instead, you bring your license from your home country with you, fill out a few documents, and your license will be converted to a Japanese one. The best place to check the validity of your current license is either the Traffic Center in your prefecture, or your country’s Embassy in Japan. Never rely only on information found online, because if you are caught driving with a license that is not valid in Japan, it is considered a very serious offense. 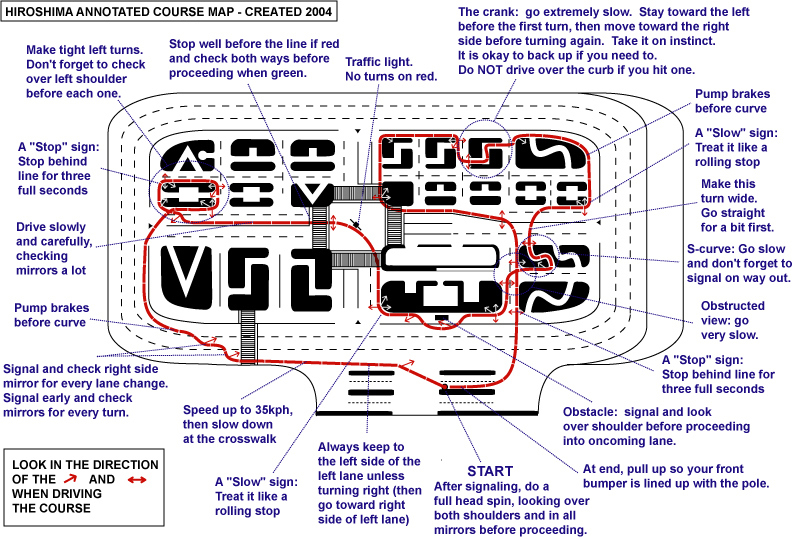 Previous driving experience is a huge plus when you are taking the test, as well as excellent knowledge on the meaning of various traffic signs (which is more or less universal worldwide). I was referred to this page to have a look at previous tests and to prepare a little for the practical exam. It was very helpful, but as I previously mentioned, some of the comments made by people on their own experience made it seem a lot more scary than it actually was. Before you apply for the test, go through this website and see if there are any traffic rules that you were not familiar with, and have a look at a few of the maps of the sample courses in other prefectures. They tend to be very similar to one another, and the Yamaguchi one is especially easy. It looks almost exactly the same as the Hiroshima one, except that instead of the two cranks in the lower left side of the map, the Yamaguchi course has the crank and the s-curve next to each other. The interview was a very comfortable experience, but it did last for about an hour in total. You have to book this interview in advance at the Center where you will be taking your test, and you have to pass this stage before you can move on to actually taking the test on another day. The interview is basically a series of questions about the driver’s license that you hold from your home country. You will be asked what the driving lessons look like, how many lessons must be taken in your country before you can pass the driving test (the total number of hours), what you actually learned, how familiar you are with first aid, etc. The police officer that is conducting the interview must get a detailed picture of how things work in your country, so that he may be able to judge whether or not you are qualified to take the test here in Japan, and not have to go through the whole six month standard procedure. My advice would be to be honest during this interview, because it is likely that the police office has already researched what the driving test looks like in your home country and may compare your answers to the ones they found. When it comes to the language of the interview, in my case it was a mix of Japanese and English. I brought a Japanese friend along to help translate the things that I didn’t understand, but I also did my best to answer questions in Japanese whenever I had the chance to. When it comes to the Yamaguchi prefecture and my own experience, it is very likely that the police officer will know enough English to understand what you are saying, however, they are very unlikely to reply in English and would probably prefer that you bring someone to translate. All of it is in Japanese, so if you are not familiar with the language it would be a good idea to bring someone with you. If you have no one to bring with you, the staff are very friendly and I’m sure that they would help you out. There were two sheets of paperwork to complete, and they mostly ask for your date of birth, name, nationality and Japanese address. I also brought the driving license from my own country, a translation of my license into Japanese (obtained from the Embassy), my International Driving Permit (although I didn’t need it because I had to take the test anyway), my Japanese ID and passport, and about 3000 yen to cover the cost of taking the test. Once you complete the paperwork and you hand it in, you can move on to the written test. This is a short and simple test. You can choose whether you want to take it in Japanese or in English. In both cases, you will be presented with 10 questions requiring you to circle the correct answer. You need 7 correct answers in order to pass the test. They are very simple and logical questions, and if you have previous driving experience there is no reason why you should be scared of failing. This is the part that people become scared of, and well, although there is nothing to fear per se, there are definitely a few things to keep in mind before you sit in the car. You will be driving an old Japanese taxi as your test car. You will no doubt have seen them on the streets of Japan, and you will also have noticed that they are very big and bulky cars. They are not difficult to drive, but if you’ve never been in such a big car before, it may take you some time to get used to it. There are many videos online that will show you what the actual practical test looks like, but there aren’t many that will teach you what to do before you enter the car. Slowly walk around the car and check for ‘damage’ that may have occurred while the car was parked. this just means that you pay attention to the car doors. When you reach the front and the back of the car, bend down all the way to look underneath the car (for animals or small children that could potentially hide underneath). Of course, there will be no actual danger during your test, but it is important that you show the police officer that you have that in mind. Once you’ve checked the outside of the car and the space beneath it, walk up to the driver’s door, look left and right for potential oncoming traffic, and then open the door and sit inside the car. the instructions for what to do inside the car are the same in all the online videos, but I found it hard to find exactly what needed to be done before you enter the car, which is why I thought that it would be a good idea to share it with you here. And although each prefecture may be a little different, it’s better to overdo it, than to not do enough and fail. During the practical test, your best bet is to drive slowly and to show that you are always checking your center and side mirrors. Besides, the test ground where you will be driving is soooooo tiny that it almost looks as if you are driving through a doll house garden. Just remember to relax and to take it smoothly. After all, if you already have a driver’s license, chances are that you have plenty of experience to pass this small course. The eye test is a very quick check of your eye sight. It does not determine your prescription. It simply asks you to say whether or not the letter E (in my case) is facing the left, the right, up or down. And that’s it. If you wear contact lenses or glasses, make it known to the person conducting the eye test. They will not ask you to remove your contacts, but they do obviously need to make a note of whether or not you need them. And that’s pretty much it. It’s not nearly as bad or as scary as you might think, and it is certainly not as difficult as some people make it out to be. Although I cannot speak for every traffic center in Japan of course, I can assure you that the staff in the Yamaguchi Community Traffic Center are very kind and very helpful. Good luck and happy driving through beautiful Japan!